Take a look at these breathtaking timepieces discovered earlier this year by our buyers at Baselworld - the watch and jewellery show in Switzerland. We’re so excited that these ultra-desirable lines are now making their way to Beaverbrooks online and in-store. Get ready to fall in love with these dream-worthy watches as much as we have. Everybody’s favourite special agent, Omega has been firmly on 007’s wrist for nearly two decades. Defined not only by an exhilarating sense of adventure, but by his role as the ultimate style icon, Omega makes the perfect sidekick for the suave and sophisticated Bond (James Bond). 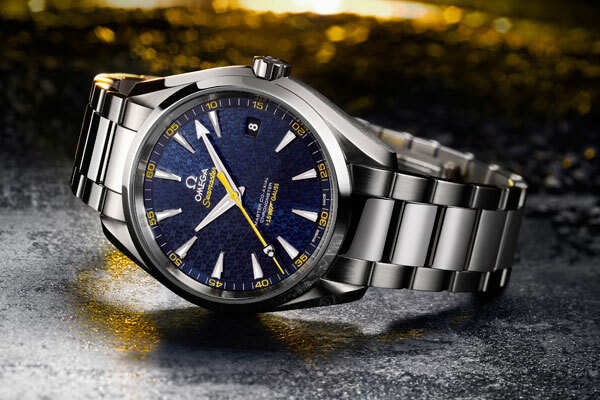 Inspired by the Bond family coat of arms, this limited edition Omega Seamaster Aqua Terra 150m model has been designed to celebrate the release of the new Bond film, Spectre later in the year. Presented on a sleek fine brushed and polished stainless steel bracelet, this imposing 41.5mm stainless steel timepiece is brought to life with the striking blue PVD dial which features the Bond family coat of arms repeatedly interlocked to create a dynamic and eye-catching pattern. The attention to detail doesn’t stop there, the flamboyant yellow seconds hand is also decorated with the coat of arms, whilst the oscillating weight, visible through the exhibition case back, has been cut and shaped to resemble a gun barrel, a symbol which can’t fail to be associated with James Bond. Beautifully engineered in every respect, this master co-axial chronometer is powered by the exclusive Omega 8507 automatic movement which is resistant to magnetic fields greater than 15,007 gauss. 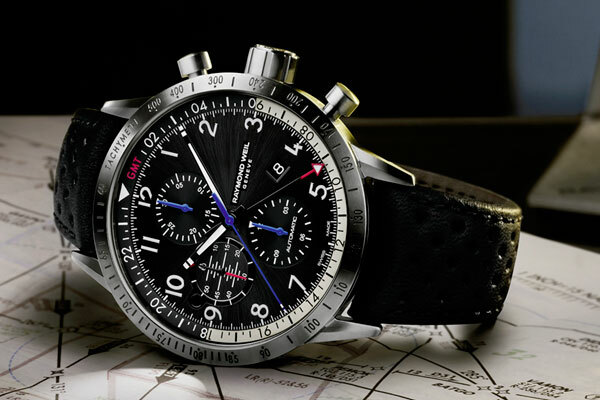 A fitting homage to the late Mr Raymond Weil and invaluable heritage he left behind, this stunning watch represents an illustrious partnership with best-in-class manufacturer Piper Aircraft Inc. to create Raymond Weil’s first-ever pilots watch. Not only an avid fan of music, Mr Raymond Weil was also passionate about aviation, obtaining his pilot’s licence at the age of 56 and passing on his enthusiasm to future generations. His grandson, Elie Bernheim says “my grandfather was not only a visionary and daring entrepreneur but also a passionate pilot and the proud owner of a Piper plane. I am sure he would be immensely proud of this new introduction”. Showcasing some unique features as well as the exquisite design and luxurious finish which is the hallmark of a Raymond Weil timepiece, the 45mm Freelancer Piper is constructed from titanium and stainless steel and features a mechanical self-winding movement with date and GMT functions. Protected by scratch resistant sapphire crystal, the charcoal coloured dial provides the perfect backdrop for the shiny blue minute and hour hands designed to resemble the aircraft rotor blades, as well as the CMT hand which recalls a compass with its eye-catching red tip. The aviator look of this beautiful watch is completed with the small seconds dial inspired by the altitude meter and its sporty black openwork leather strap. Water resistant to 100m, with a 46-hour power reserve and tachometric bezel, the Raymond Weil Freelancer Piper will enable all flying enthusiasts to conquer new horizons. Each Freelancer Piper watch is presented in a special box containing a small-scale model of the Raymond Weil branded aircraft. 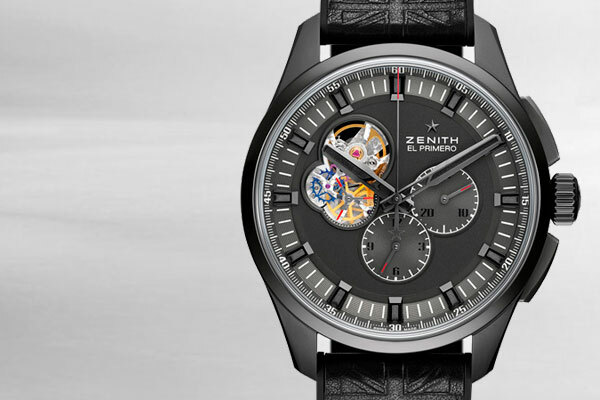 The first in a series of limited edition timepieces from Zenith, this Zenith El Primero is a tribute to one of the most iconic bands of all time - The Rolling Stones. Expressing a rock n’ roll style, this dramatic timepiece is unique amongst the Chronomaster collection with its masculine 45mm DLC-coated black titanium case. 1969 was a special year for a number of reasons. Man walked on the moon, the ancestor of the Internet was launched, Concorde defied the sound barrier and the Zenith El Primero calibre, the first automatic chronograph, was born. Beating at 36,000 vibrations per minute, making it the world’s most accurate chronograph, the El Primero with its 50-hour power reserve demonstrated exceptional performance for such a high-frequency movement. Today, over 40 years later, the El Primero movement remains legendary and remains the world’s most precise series-made calibre and the only one capable of measuring times to the nearest 1/10th of a second. Fastened with a black rubber strap with leather coating and a 'Union Jack' pattern, this Zeinith El Primero Chronomaster 1969 will always be a classic, whilst its Rolling Stones influence gives it a powerful and daring edge. Scratch-resistant and domed sapphire crystal with anti-reflective treatment on both sides, protects the black dial enhanced by black ruthenium-plated hour markers and hands, both coated with SuperLuminova for excellent readability and finished with two sub-dials, and an impressive open aperture, revealing the legendary beating heart of the El Primero movement. Water resistant to 100m, this legendary timepiece is powered by an El Primero 4061 automatic movement. 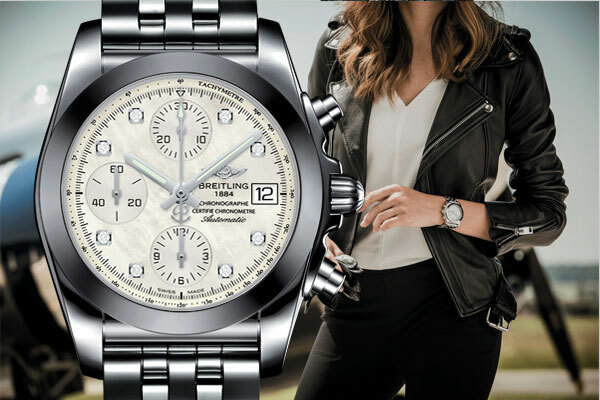 Setting off to conquer feminine wrists in a new model with a highly contemporary, finished with sleek and elegant touches, the Breitling Chronomat has asserted itself as the ultimate aviator’s chronograph for over 30 years. Dedicated to performance, sporting feats and surpassing personal limits, Breitling have reimagined this legendary collection with a paired down 38mm diameter suited for smaller wrists. Refined and sophisticated, the face of this distinctive model has also been adapted, taking on a sleeker style which is given a feminine edge with a pretty white mother of pearl dial and glittering diamond hour makers which form a stark contrast against the technical chronograph counters and date window. True to the Breitling philosophy, by far the watch’s standout characteristic is its high-tech tungsten carbide bezel, a smooth ultra-hard and scratch proof material whose grey tone creates a subtle contrast with the polished stainless steel of the case. As always, endurance is the primary mission for the Breitling Chronomat 38 SleekT, whose sturdy steel case is water resistant to 100m and features glareproofed sapphire crystal, luminescent hands and large hour markers, and ergonomic stainless steel bracelet and is powered by a selfwinding chronograph movement which is chronometer certified by the COSC. Determinedly inventing a new brand of sporting elegance, the Breitling Chronomat 38 SleekT is produced with extreme concern for details and is a concentrated blend of Breitling style and precision with a surprising feminine twist. 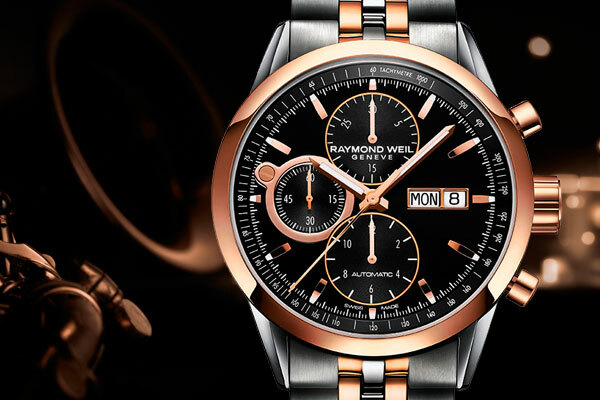 Highlighting immaculate watch engineering and the highest quality precision, this Raymond Weil Freelancer chronograph showcases a contemporary, yet luxurious style with its mix of both stainless steel and rose gold PVD, paired with beautiful craftsmanship from the watch’s chronograph dial to the Swiss made automatic movement. This masculine design is fastened with a contemporary stainless steel and rose gold PVD bracelet and features a 42mm stainless steel and rose gold PVD case with a polished bezel. Sapphire crystal glass protects the distinctive black dial, further enhanced by luxurious rose golden baton hour markers and three chronograph sub dials, finished with a day date window at 3 o'clock. Water resistant to 100m, this exquisite timepiece is powered by a Swiss made automatic movement, for the best performance and reliability. The ultimate way to show off your refined and polished style, this incredibly handsome timepiece will never go out of style. As always, endurance is the primary mission for the Breitling Chronomat 38 SleekT, whose sturdy steel case is water resistant to 100m and features glareproofed sapphire crystal, luminescent hands and diamond hour markers, and ergonomic stainless steel bracelet and is powered by a selfwinding chronograph movement which is chronometer certified by the COSC.